The truth is, I like getting acquainted with new ingredients, foods, vegetables, products and wine. I like opening a cookbook from an unfamiliar culture. I like a culinary challenge. But mostly, I like to add to my kitchen mastery. Think wizard with a wand---only I wield a sword. My apron is my armor. I chat a bit, talk a lot, cook and learn, write about it and go out and apply my curiosity some more. That is the nature of this blog. Since Tuscany boasts fresh fava beans in the Spring---something a little trickier to come by in the states---I was all about buying myself a kilo and getting to know this typical Italian bean. The guy at the stand opened the pod and he and I ate the beans raw---delish! He said to put it with pasta, but I also know fava beans pair well with Pecorino and/or Parmesan cheese and bruschetta. Fava beans are special because they wear two jackets. The big ole pod (pictured top) houses beans inside. But the beans inside still have an outer husk. You remove that as well. It is a labor of love just for a few bites of this tastes-like-spring bean. I found the easiest way to take off the second little jacket was to pinch one end with the edge of a small paring knife then squeeze out the little bean inside. My rather large pile of fava bean pods ended up being a meager handful of edible favas. I skipped around online: one blog said to grill the whole pods, then slip out the beans for eating. Both at the market when I ate the beans raw and in my grill, pop open and eat experiment: the little beans still had one jacket on. Was fine for fresh eating, but not great out of the grilled pods. I won't grill and eat them this way again... mostly because the effort to remove that last jacket is so, so worth it. I tried the laborious route: I blanched the pods for 2 minutes, then gave them an ice bath. I removed the beans from the pods, then blanched those beans for 2 minutes, gave them an ice bath and finally, removed the second jacket (see final, shelled-twice beans in tiny bowl pic). (PS to keep green veggies super green, it is key to have salt in your boiling water then follow the boiling with an ice bath---this locks in the flavor, color and nutrients). I mixed some of the beans with shavings of Parmesan and a little oil and salt: scrumptious. I also took a few bites worth, pureed it, added a splash of lemon juice, pinch of thyme, salt and pepper and olive oil---and made a fava bean spread. This went on top of one token, grilled slice of bread and became an instant favorite. Bites plain are perfect---I also added drizzled olive oil and coarse pepper to a few bites. You could shave some cheese for the top. Not only does the color scream SPRING---the taste does too. 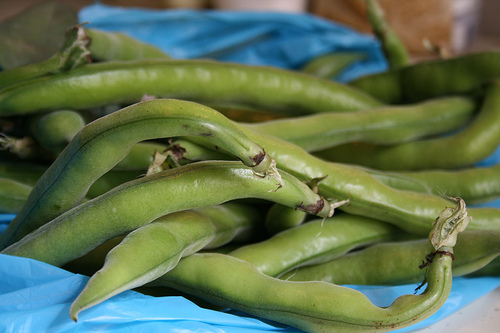 If you see a big pile of fava beans at your farmer's market: you should try them. If just for, hard-earned bites.